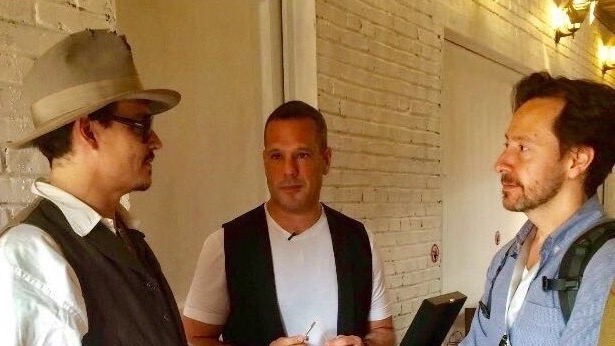 Antipodal Talent 美中人才 has partnered with Executive Producer and Creative Director David Kolko (in the blue shirt with actor Johnny Depp in the accompanying photo) for its latest project. For over 20 years David has been leading teams in the creation of television and video content for MTV, NBC, HBO, FOX, CBS, and Sprint Mobile, along with many other platforms and networks. In addition, David personally has over 700 hours of live, interactive television production under his belt. On top of all of that, David brings an important branding and marketing perspective to the project, having spent five years at a leading advertising agency before starting his television production career. Finally, although originally from the U.S., much of David’s recent work has been international, with a particular focus on Asia, including being involved with the production of the second season of Asia’s Next Top Model. Needless to say, we are very happy to have David as part of our team! To find out more about David Kolko, please visit his LinkedIn profile on the web at https://www.linkedin.com/in/davidkolko. Share the post "Antipodal Talent Welcomes Executive Producer David Kolko"